The Ghaychak or Ghijek is a round-bodied musical instrument with three or four metal strings and a short fretless neck. Ghijek is very popular throughout Central Asia. It is used by Iranians, Afghans, Uzbeks, Uyghurs, Tajiks, Turkmens and Qaraqalpaks. Ghidjak is the only bow instrument found in the Pamirs. Ghijek is usually carved from the wood of an apricot tree. Very thin wood covers the bowl, and cowhide is stretched inside the drum as a sound table. The bowl has many holes, to make the sound more resonant, and it is adorned with colorful ornaments. Its sound box is metal or wooden, and it has three or four metal strings and a neck made of willow, apricot or mulberry wood. It is tuned in intervals of fourths. The sound box is carved out of a single piece of wood. The upper orifice is partly covered in the middle by the handle and the lower one is covered by a skin membrane against which rest the bridge. The bow is made of horsehair and tied to a curved stick. Ghijek is a spiked fiddle, meaning it is meant to be played upright, rather than horizontally like a western fiddle. It has four strings and a short neck, making it similar to a modern violin. To play Ghijek , place the head on your leg, the neck in your left hand, and hold the bow with your right. If you are familiar with playing a violin, playing Ghijek should come easily. Ghijek produces a trembling, whining sound and is often highly decorated. To hear Ghijek is to hear the spring, flowers blooming, birds singing. 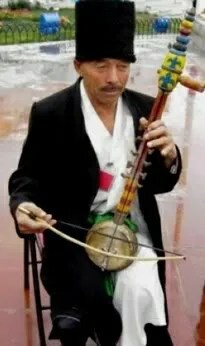 Ghijek is the most popular bowed instrument in Uyghur orchestra. It is also played alone in solo recitals. Ghijek first appeared in a bow and arrow shape in early Uyghur Oral histories. Its print debut occurred during the Song Dynasty (960-1279CE) in China, where it was described as having horsetail strings. 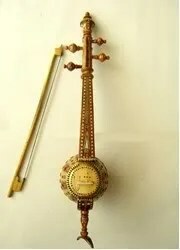 The instrument seemed to develop in parallel with the more well known Persian Ghijek , yet the Uyghur Ghijek was unique. These Ghijek typically had 2 bowed strings, and 10 sympathetic strings, as noted by Qing Dynasty (1644-1911 CE) scholars. Over time, Ghijek is standardized on the short neck form. In 1955, Uyghur masters standardized Ghijek to 4 strings and aligned the tones with the western scale, a modern instrument ties to its over 1000 year tradition. Posted on April 13, 2011 May 17, 2017 by Interact ChinaPosted in Music, String InstrumentsTagged Ghaychak, Ghijak, Ghijek, Musical Instruments, Uighur, Uyghur.